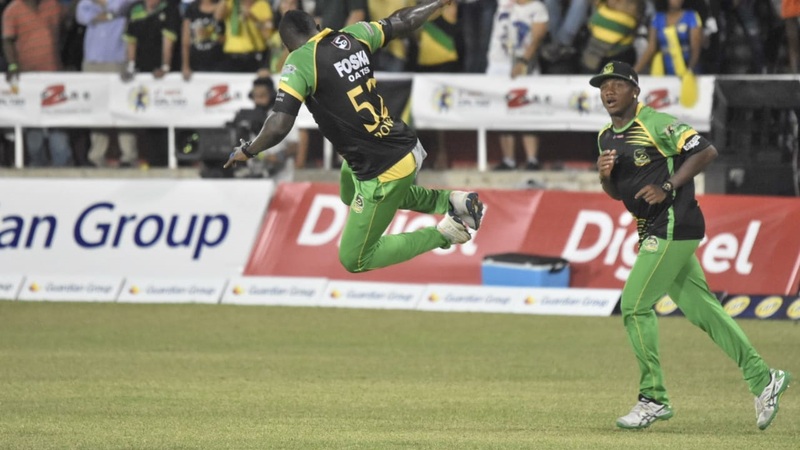 Jamaica Tallawahs batsman Rovman Powell (left) celebrates the fall of wicket during the Caribbean Premier League (CPL) match against St Kitts & Nevis Patriots at Sabina Park on Wednesday night. (PHOTO: Marlon Reid). 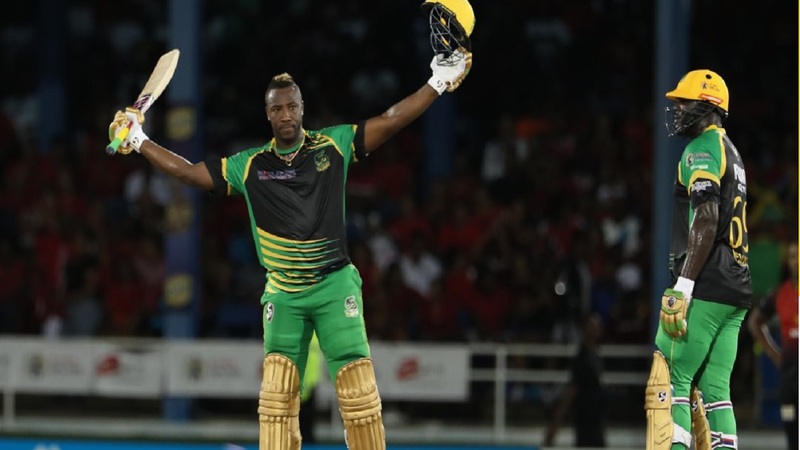 Jamaica Tallawahs secured their third straight victory of the 2018 Caribbean Premier League (CPL) season on Wednesday night by defeating Chris Gayle's St Kitts & Nevis Patriots by 47 at Sabina Park. Set a victory target of 179, the Patriots were restricted to 131 for nine from their allotted 20 overs. St Kitts and Nevis Patriots, fifth in the standings on two points, were suffering their second defeat from three matches. In the run chase only two batsmen - Gayle (24 runs from 25 balls) and Mahmudullah (22 from 15) managed to get over 20 runs. 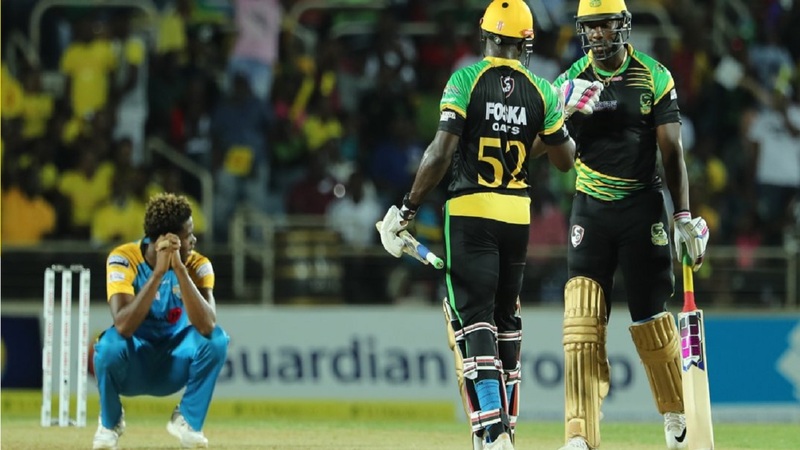 Gayle, who spent most of the Tallawahs innings off the field with an injured hand, was put down in the second over by Kennar Lewis at gully off fast bowler Oshane Thomas, ruled for a brief period. St Kitts & Nevis Patriots were reduced to 39 for three at the end of the fifth over with the opening pair of Evin Lewis, Tom Cooper and Gayle back in the pavilion. Lewis was the first to go with only a run on the board. The West Indies player, yet to get off the mark, received a good delivery from pacer Oshane Thomas, and in trying to defend he got an edge, which carried to wicket keeper Ross Taylor. In the next over, Cooper was dismissed for seven to leave the Patriots struggling on nine for two after 3.5 overs. Cooper in an attempt to clear the boundary, moved to his right and hit pacer Krishmar Santokie straight to captain Andre Russell. Gayle, who only scored a run from 15 deliveries at the fall of the second wicket, then hammered three big sixes, two off exciting fast bowler Oshane Thomas in the fourth, to improve the run rate. Gayle continued his explosive hitting in the fifth over, hammering Steven Jacobs for a huge six and then a four. However, the off spinner got the big man with his final delivery of the fifth over when he tossed up the ball and Gayle sliced it straight to Thomas, at short third-man, to put his team in more trouble with the score at 39 for three with only five overs bowled. Wickets continued to fall at regular intervals as the likes of Devon Thomas (10 from 11), Anton Devcich (11 from 10) and Ben Cutting (two from five) all tried and failed to put life into the Patriots innings. Australian leg spinner Adam Zampa snuffed out any hopes of a Patriots recovery when he ended a promising partnership between Carlos Brathwaite (10 from 13) and Mahmudullah (22) with a googly that foxed the Bangladesh star and knocked back the off stump before the impressive Imad Wasim (two for 21) truly ended the contest when he had Brathwaite smartly caught in the deep by Rovman Powell. With the game gone, pacer Sheldon Cottrell enjoyed himself with a couple of huge sixes late in the innings before being cleaned up by the returning fast bowler Krishmar Santokie. Earlier, Jamaica Tallawahs, sent in to bat, scored 178 for four off their allotted 20 overs. Taylor led the batting for the Tallawahs with 51 not out from 31 balls, his first half-century for the season. 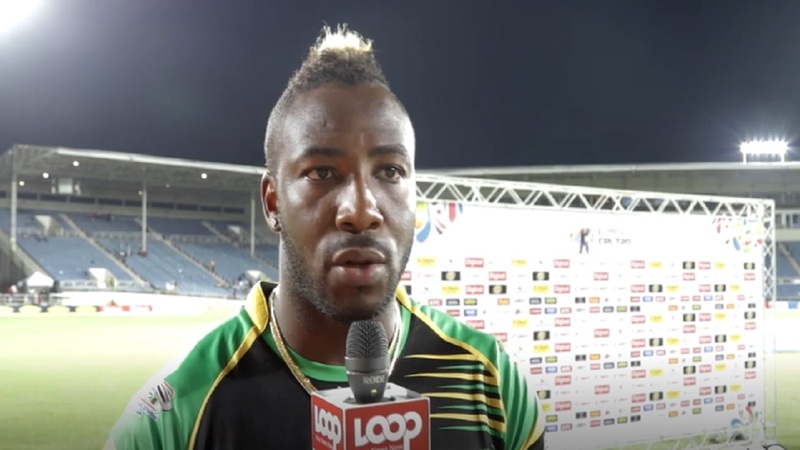 However, Taylor was very lucky to be at the crease as with the Tallawahs on 77 for two he skewed an attempted drive to long-off off part-time off-spinner Anton Devcich, having made just six from 10 balls. Devcich, though, had overstepped and the no-ball would prove costly; Taylor went on to take the game well beyond the Patriots. Kennar Lewis (49 from 24 balls) and Glenn Phillips (41 from 38) supported well. The Tallawahs got off to a flying start with Phillips and Lewis putting on 65 off 6.2 overs for the first wicket. Sandeep Lamichhane, a 19-year-old right-handed leg spinner from Nepal, got the breakthrough when he had the aggressive Lewis caught at long-off by Tom Cooper. The breakthrough came three balls after Phillips was put down at deep mid-wicket off the bowling of Carlos Brathwaite. The 50-run partnership between the opening pair came off 31 balls in 22 minutes. Of the 50-run partnership, Lewis hammered 40 from 19 balls. When Lewis was dismissed he hammered four sixes and four fours. Two balls after the breakthrough, Lamichhane struck again, this time he had Andre McCarthy LBW without scoring.McCarthy received a googly and in trying to defend it, he missed completely and the ball crashed into his pads. 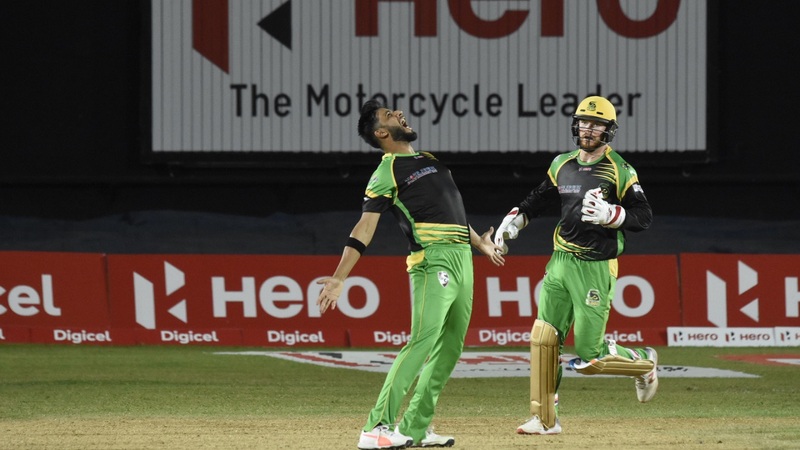 Phillips and the lucky Taylor then put on 45 for the third wicket before Australian bowler Benjamin Cutting had Phillips LBW with the first ball of the 13th over to reduce Tallawahs to 107 for three in 13.1 overs. Phillips hit three sixes and a four in his 41. The Tallawahs then added a further 71 runs and in that process only lost one wicket Rovman Powell for 18, to put up a competitive total. Lamichhane was the most successful bowler for the Patriots with two for 21 from his allotted four overs. Brathwaite and Cutting picked up a wicket each.